Worried about college debt? 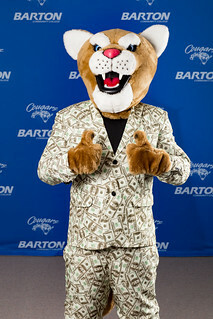 Come to Barton and let your GPA pay the way - your ACT score or GPA could score you books and tuition! See the table below for more details. Available to first time college students who graduated the previous academic year. The deadline to apply for a scholarship for Fall courses is May 1. The deadline for Spring courses is December 1. Barton Bound is available only to Kansas residents who are graduates of a Kansas High School. The scholarship will be available for six full-time semesters, automatically renewing at the student's current Barton GPA. The student will not have to complete a new scholarship application for renewal of their award. Jayhawk Conference rules state that students receiving an athletic books and tuition scholarship must meet a 3.5 GPA criteria upon high school graduation or entrance to the College to accept a Barton academic scholarship in addition to the Barton athletic scholarship. For a student athlete to continue receiving the Barton academic scholarship in addition to the Barton athletic scholarship, they must hold and maintain a minimum 3.5 cumulative GPA at Barton Community College. Students may not receive a combination of activity/performance scholarships and athletic scholarships. Awards are subject to available funding. Highest priority is given to graduating seniors and incoming non-traditional students who submit scholarship applications by the priority deadline. Next priority is given to renewals of current scholarships. Interested in other options? Learn more about Types of Financial Aid and Scholarships.